The tip-off to the NBA season is looking like a total air ball for Under Armour. Under Armour (UA) stock crashed 15% after the markets opened on Tuesday when the sportswear maker warned that it's astronomical growth will come back to earth over the next few years. If Under Armour closes down by more than 11.25%, it will be the worst day for the stock since at least 2009. Under Armour sales have soared by at least 20% for the past 26 straight quarters. However, Under Armour is warning that its golden stretch of growth is about to slow. The company is abandoning its goal to hit $800 million in operating profit by 2018 -- a target Under Armour had announced to investors just last year. It also said 2016 sales will fall shy of expectations. The warnings shocked investors, who are pounding the stock. Under Armour's incredible streak of growth has been driven by big wins in footwear and with international customers. Its recent success is thanks in part to an endorsement deal with superstar Steph Curry, whose new-look Golden State Warriors start the NBA season Tuesday night. However, a slowdown is underway. Specifically, Under Armour said its gross margins, a closely-watched measure of profitability, have been hurt by the bankruptcy and liquidation of Sports Authority. "We saw something pretty big happen...It's definitely been eye-opening for us," Under Armour CEO Kevin Plank said on a conference call with analysts. Plank explained that this doesn't mean the "demand for the Under Armour brand has disappeared." Instead, it just means the company needs to be more "thoughtful" about reaching consumers. That's the other thing causing concern among investors. Under Armour said it must build the distribution and infrastructure needed to scale its fast-growing business. That costs money, and eats into future profits. "The growth remains intact, it just costs more short-term investment dollars to achieve," Plank said. While Under Armour scrapped its long-term profit goal, it reiterated its target of hitting $7.5 billion in total sales by 2018. 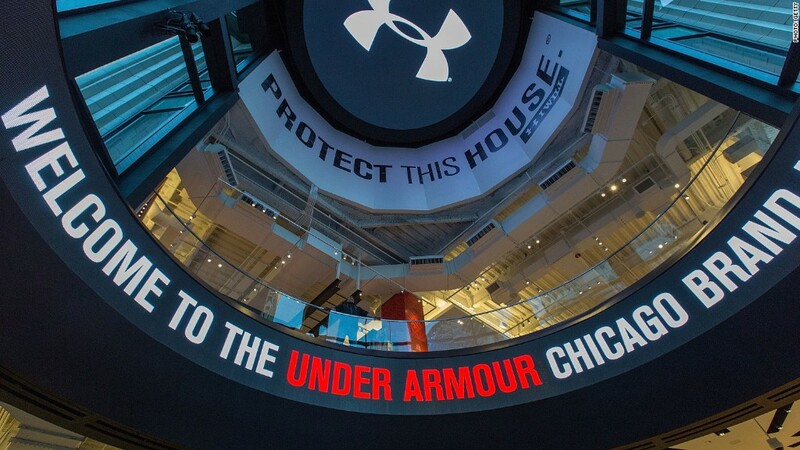 Under Armour continues to experience a slowdown in its core North American market. Sales rose 16% last quarter, but that's down significantly from earlier this year. "Under Armour is starting to reach maturity in some of its segments, especially male sporting apparel," Carter Harrison, retail analyst at research firm Conlumino, wrote in a report. All of this explains why Under Amour shares are now down 21% this year, and off by one-third over the past 12 months. Nike shares also took a bit of a hit on Tuesday, slipping 1%. Nike (NKE) is now down 18% this year, easily making it the worst Dow stock of 2016. Plank explained that Under Armour still wants to conquer the sports apparel market that Nike rules. "We are in this for the long haul. The opportunity we see is to be the best in the world," he said.